‘The Crooked Man’ Is Coming to DVD! 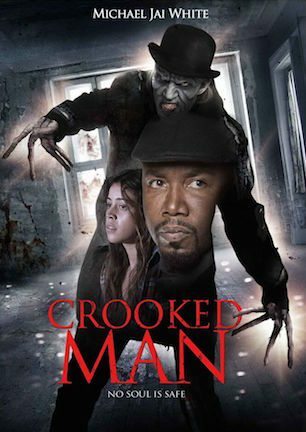 The SyFy network recently aired a film called ‘The Crooked Man‘ last Halloween that starred Spawn and Black Dynamite himself Michael Jai White. This is a horror film based on the kid’s nursery rhyme. The Crooked Man recently showed up in ‘The Conjuring 2‘, and there was talk about a spinoff movie. This was not that movie. Now, I haven’t seen this yet, but I’ve only heard how bad it is. I mean besides ‘Battlestar Galactica‘, what does SyFy give us thats quality? Either way, Michael Jai White is a true badass, and I’ll see anything with him in it, even this horror film. ‘The Crooked Man‘ comes to DVD and Digital HD on Valentines Day – HOORAY! I don’t see anything about a Blu-ray or any bonus features, and with a suggested retail price of $20, or even its current Amazon Price of $13, I’m just gonna go ahead and say Skip This, until it releases on Netflix for free, or they come with a big badass special edition. No soul is safe when the chilling horror film The Crooked Man arrives on DVD, Digital HD and On Demand February 14 from Lionsgate. As a young girl, Olivia (Angelique Rivera) recited a haunting rhyme at a slumber party, which summoned the demonic figure known as the Crooked Man. Years later, she must team up with a reclusive mastermind (Michael Jai White) to defeat the demon before they die by his hands. This entry was posted on Tuesday, January 17th, 2017 at 1:00 pm	and is filed under Film, News. You can follow any responses to this entry through the RSS 2.0 feed. You can skip to the end and leave a response. Pinging is currently not allowed. « Something will ‘Rattle’ your bones in the horror genre soon!